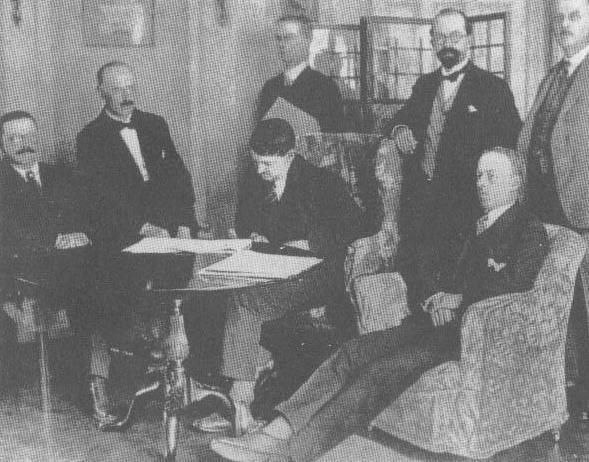 Collins is pictured (center) reading over the terms of the Anglo-Irish Treaty with his fellow Irish delegates. "There is a view that the Irish negotiators were out-maneuvered, out-witted, out-psyched, by more formidable and more experienced negotiators on the British side. The British were certainly more experienced. But what would more experience have achieved? The Irish delegates did, after all, achieve more than previous Irish representatives, including the vastly more experienced John Redmond between 1912 and 1918. If Sinn Féin were out-witted on the north, it had proved powerless to prevent the imposition of the Government of Ireland Act. And that wasn’t as much a question of being out-witted as of being out-gunned. The bottom line that is so easily forgotten in the welter of discussion about the diplomacy of the Treaty negotiations is that Britain carried far the bigger gun. Until 5 December it was kept more or less discreetly hidden. Then Lloyd George pulled it out, laid it on the table, and threatened to use it." "That any man has greatness thrust upon him is a myth; in truth fate merely presents the opportunity while ambition and ability determine the performance. So it was with Michael Collins, the unlikely Finance Minister who proved himself an administrator par excellence." "When the First Dáil appointed Collins to Finance, in succession to Eoin MacNeill, a more appropriate appointee could hardly have been visualized. For despite his relative anonymity and comparatively young age—at twenty-nine he was the youngest in a cabinet whose average age was forty-four years—he discharged his duties with considerable ease, incomparable efficiency and definitive purpose during the Anglo-Irish and Civil Wars." "His greatest achievement in finance was undoubtedly the successful organization of the first National Loan. Yet, amongst his cabinet colleagues, Collins was facile princeps, demonstrating an administrative flair that was both meticulous and perspicacious." "Apart from Finance, Collins also held three other important military positions: Adjutant-General, Director of Intelligence and Director of Organisation. He conducted his military duties from offices in Bachelors Walk and Cullenswood House, Ranelagh, while his covert Brotherhood operations were directed through verbal instructions, from secret locations, usually ‘Joint no. 3’ (Vaughan’s Hotel). Because Collins was extremely well organized and efficient, he was unwilling to allow social activities [to] impinge on his work. In January 1920, for example, as the head of the London office, Art O’Brien, was visiting Dublin, Collins advised him that ‘I am so busy at present that a few hours away from my work on an ordinary day means a serious upset to me.’"
"In overall terms, Collins’ performance in Finance was outstanding by any criteria. … Collins’ personal organization skills were exceptional, allowing him to hold four major positions simultaneously, prompting him to impose order and clarity on a world of disorder and confusion. If his unexpected death robbed the state of its most capable administrator, it also denies the historian the opportunity to compare him with his successors in Finance." "The characteristics which mark Collins out as a remarkably successful Director of Intelligence during the War of Independence include his evident appreciation of the importance of the collection and assessment of information as primary elements of intelligence operations which should precede action; his partial penetration of his adversary’s own intelligence system; the efficiency and ruthlessness with which action based on good intelligence was taken; and his success in preserving the security and efficiency of his own organization both in Dublin and in Britain despite the pressures it operated under because of the constant threat of raids, arrests and the capture of documents." "But the outstanding figure in all G.H.Q. was Michael Collins, Director of Intelligence. This man was without a shadow of doubt, the effective driving force and the backbone at G.H.Q. of the armed action of the nation against the enemy. A tireless, ruthless, dominating man of great capacities to defeat the enemy. Versatile to an amazing degree Collins who had fought through 1916, had after his release from prison become one of the chief organisers of the volunteers. At the same time he was one of the Secretaries of Sinn Féin, the political wing, and was largely instrumental in the victories of Sinn Féin in the 1918 elections. While maintaining his hold on the political machine and becoming Minister of Finance in the first Dáil Cabinet of the Irish Republic, he was Adjutant General of the I.R.A., feverishly pushing the organisation of the armed resistance movement. Quickly realising the importance of the Army Intelligence Department, he took over that responsibility and built a splendid organisation from the ground upwards. 1920 saw Michael Collins Acting President of the Republic, while Mr. de Valera was in America and Mr. Griffith was in jail. Yet with all these Ministerial, political and administrative responsibilities his Army activities increased. There was no branch of the Army Headquarters into which he did not enter. Policy, training, organisation, arms, supplies, propaganda, all felt the impact of his personality and efforts." "The most important of the new leaders was Michael Collins, who played a minor role in the Rising, was interned, and on release looked after ex-prisoners, thus drawing into his own hands the loose strands of what, for want of a better term, could be called ‘Irish-Ireland.’ In 1917, Michael Collins was twenty-seven years of age. He reorganized the IRB, then dominated its ruling inner circle. He had no formal education beyond primary school, had worked in the Post Office in London, was of small-farm background—a Ribbonman1 operating at national level. The Rising was a shock—too romantic, he told a friend" (Sean Cronin, Irish Nationalism: A History of its Roots and Ideology). "Realists appealed to Collins. There would be no more glorious protests in arms, he decided. He built a cadre of realists around him, first in the IRB, then at Volunteer headquarters, where he took over Pearse’s old post as Director of Organization before becoming Director of Intelligence, finally in Dáil Eireann, as the underground government’s very effective Minister for Finance. Collins was a doer. Essentially a well-informed opportunist with very few scruples, his entire ideology could be stated in five words: ‘The Irish should govern themselves.’"
"The one thing which he could not and would not tolerate was failure, even though sound reason was given for such failure. Harry Boland, aware of this peculiar insistence of Collins’, argued that circumstances often ruled the success or failure of a particular job. ‘Not at all,’ replied Collins; ‘More often than not it is the slipshod handling of the job which brings about the failure.’ … He never dealt in theory; he had no time for it; and he refused to listen to anything which dealt only in the theoretical. He took the standpoint of a practical man whenever plans were submitted to him for approval. No one was quicker to realize that great gulf which yawned between the possible success of a theoretical plan and the more probable success of a practical plan. He was a realist, as distinct from the idealists who have numerously abounded in Ireland. It may be thought that his judgment on Padraic Pearse and the Easter Rising in general was a harsh judgment (Collins thought the Easter Rising a most inappropriate occasion for ‘memoranda couched in poetic phrases’). … Collins was a realist to the point of bluntness. It was not that he lacked the finer points of etiquette—he himself was sprung from an ancient clan; but because of the conditions in which he spent the most fruitful of his years, he exorcised everything which might hinder quick, concise thinking." "There was a touch of the Napoleonic in Collins’ military brilliance. He used thorough, unorthodox methods to beat his enemy, giving tactical lessons which have not been lost since his time on other guerilla fighters in many parts of the world. Being, by natural instinct, acutely aware of the possibilities attached to situations, this instinct or flair allowed of a thorough, but quick and accurate, assessment; and by this means ‘on the spot’ decisions were a matter of second nature to him. ‘I have seen him,’ remarked one of his former lieutenants, ‘do no more than push his hand through his hair; yet in that quick action the decision was made.’ A general observation that ‘Collins was forever wanting to get things done’ fits well with the restless temperament of a man who had the idea that sleep was a waste of valuable time. The driving force of the energy within him was the reason for this while stong will-power kept his nerves under full control. Mr. Moylett (an Irish businessman, and a friend of both Collins’ and Griffith’s), speaking to [Rex Taylor], recalled that Collins appeared to be quite fresh, in contrast to most others, after a debate which had lasted for eighteen hours. The tag of ‘gunman’ which became attached to his name was a title for which he had a personal loathing. Collins never killed a man in his life, except perhaps during the actual fighting operations in 1916. It was given to him, principally, by the press chiefs of Britain, who sought to glamorize a ‘wanted’ man. The events of ‘Bloody Sunday’ provided a field-day for them, and they piled on the horror. Further attempts have made in recent times to restore that old and untrue legend of ‘Collins the gunman.’"
Author Ronan Fanning commented that Collins held vital and valuable "the reality of independence, not the rhetoric of republicanism" ("Michael Collins: An Overview" Michael Collins and the Making of the Irish State). In the end, this sentiment is worth remembering. To Collins, it was more important to see real freedom from British rule than to get caught up in semantics. If nothing else is thought of Collins' role as a politician, let it be that he did indeed attain the "freedom to achieve freedom." 1- A Ribbonman was a member of a 19th century Irish group, The Ribbon Society. The Ribbon Society was originally conceived to stand as opposition to the Orangemen, but later it became a group of tenant farmers who joined together to prevent eviction by their landlords. They are called Ribbonmen because they wore a green ribbon to identify themselves. 2- The Internet Encyclopedia of Philosophy has a good selection regarding political realism. To read it, click here. The international relations program at Mount Holyoke College also has a helpful article posted on political realism. To read it, click here.